Farm tractors continue to evolve—getting larger and more powerful, for example—in order to help farmers increase operational efficiency and productivity. Although the use of massive tractors on modern farms allows for more work to be done, in less time, it has also created new challenges that threaten to negate the advantages offered by these titanic tractors. One of the most notable challenges with today’s high-horsepower tractors is power hop. Power hop refers to the bouncing that can occur on four-wheel drive and mechanical front-wheel drive tractors when operating under draft loads, and is caused by the tire’s sidewall flexing and recoiling as it gains traction. Although it’s common for the bouncing experienced during power hop to start simply as an annoying vibration, that bouncing can escalate over time, creating a frustrating and uncomfortable ride for the operator and potentially damaging the tractor itself. Most importantly, a tractor that experiences power hop isn’t operating at its peak performance, which negatively affects productivity and, ultimately, profit. Power hop is typically a problem for high-horsepower tractors operating in dry, loose soils, as the lack of moisture can make gaining traction difficult. While a good rain might be the cure to the power hop plaguing your tractor, few farmers have the luxury of waiting for Mother Nature to solve their problems. In fact, like most things on the farm, power hop is most likely to make an appearance at the least opportune time. The simplest way to prevent power hop—and a good habit to build anyway—is to ensure your tractor is properly ballasted, has the right weight distribution, and that its tires are set at the correct inflation pressure. A certain amount of weight is required for the efficient transfer of horsepower to the ground, and one of the primary causes of power hop is when the overall weight of the tractor is too light for its horsepower. 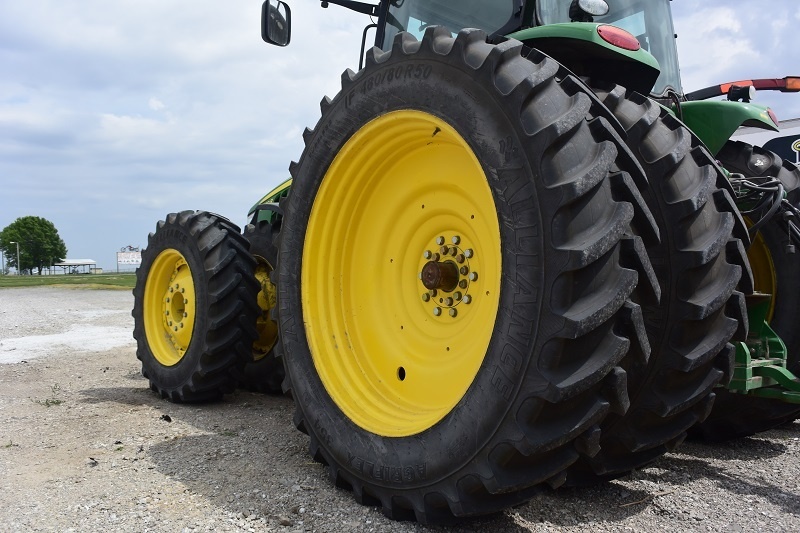 According to ATA’s James Crouch, mechanical front wheel drive (MFWD) tractors should try to strike a balance between 130 and 140 lbs. per PTO horsepower, and four-wheel drive (4WD) should be between 95 and 110 lbs. per PTO horsepower. Of course, those are just general guidelines, and James suggests consulting your equipment dealer to get the correct number for your rig. If it’s discovered that an underweight tractor is the cause of power hop, the problem is remedied with cast iron ballast. Watch our Tireside Chat video to learn how to properly ballast your tires! Equally important as overall tractor weight is the way the weight is distributed between front and rear axles. This is especially true for 4WD tractors, as they are sensitive to poor weight distribution. A good rule of thumb is that 4WD tractors should have the weight almost evenly split between the front and rear axles, while MFWD tractors should aim for an approximately 70/30 split with the majority of the weight on the rear axle. As if you needed another reason to monitor your tractor’s pressure, both under-inflated and over-inflated tires can result in power hop. The simplest example of this occurs with 4WD tractors. Because 4WD tractors operate on a 1:1 gear ratio, the front and rear tires must share the exact same overall diameter and rolling circumference to ensure that they are moving at the same speed. Under inflation results in a tire shorter than the others, while over inflation results in a tire taller than the others—and either can lead to power hop. Alliance ag tires are engineered to maximize the large investment farmers make in these mammoth machines. However, problems such as power hop work to negate these advantages, costing farmers everything from a loss in a machine’s productivity to shorter tire life, and ultimately hurting their bottom line. To make the most of your tires, follow Alliance’s series of Tireside Chats! They’re filled with information and tips to help you maximize not just your tires, but also your machines.